Designed for small and medium installations, this professional client-server software (a single Shop can be activated) permits the connection of no more than 2 positions (one of which acts as server) for managing a maximum number of dispensers, which depends on the power of the PC available, and for managing the cards and operations associated with wine tasting. One or more computers are required with Windows 8, Windows 7, XP or Vista. 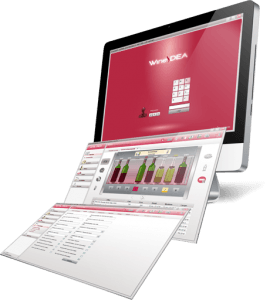 “WineIDEA” Pos Ready also has a MYSQL database which holds all the information on management of the wines. There is also a useful integrated system backup function and an update download facility. Designed for medium to large installations, this professional client-server software (a single Shop can be activated) permits the connection of an unlimited number of positions and a dedicated server, included in supply or installed directly on the client’s server platform, for managing a maximum number of dispensers which depends on the power of the server available, and for managing the cards and operations associated with wine tasting. A Windows Server and one or more POS computers are required with Windows 8, Windows 7, XP or Vista. “WineIDEA Revolution” also has a MYSQL database which holds all the information on the management of the wines. There is also a useful integrated system backup function and an update download facility. Professional software for intensive use and for big installations; this professional client-server software allows the activation of various shops and the connection of an unlimited number of positions and a dedicated server, included in supply or installed directly on the client’s server platform, for managing a maximum number of dispensers which depends on the power of the server available, and for managing the cards and operations associated with wine tasting.